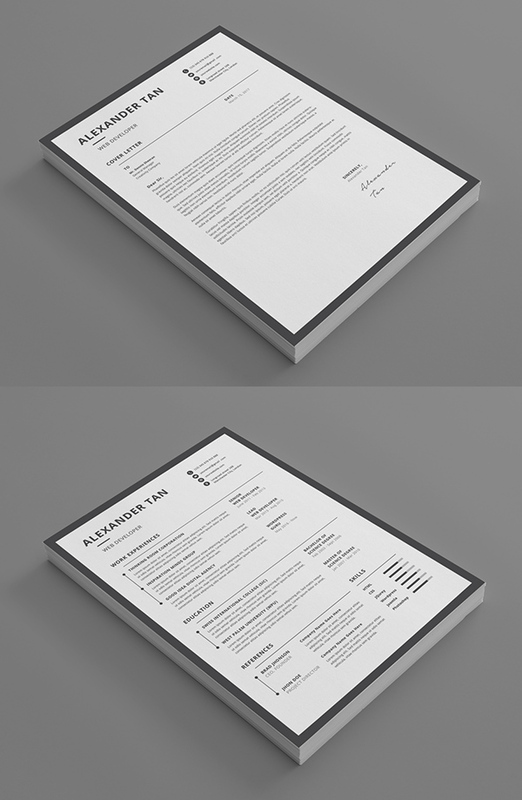 Professional, clean and minimal CV /Resume Templates ready to print designs can assist you achieve the desirable job. New simple Resume Templates are fully editable and easy to customize. These template are perfect for those who want to make a good impression. All templates are perfect for photographers, designers, and developers with easy to customize fully Photoshop layered PSD files. 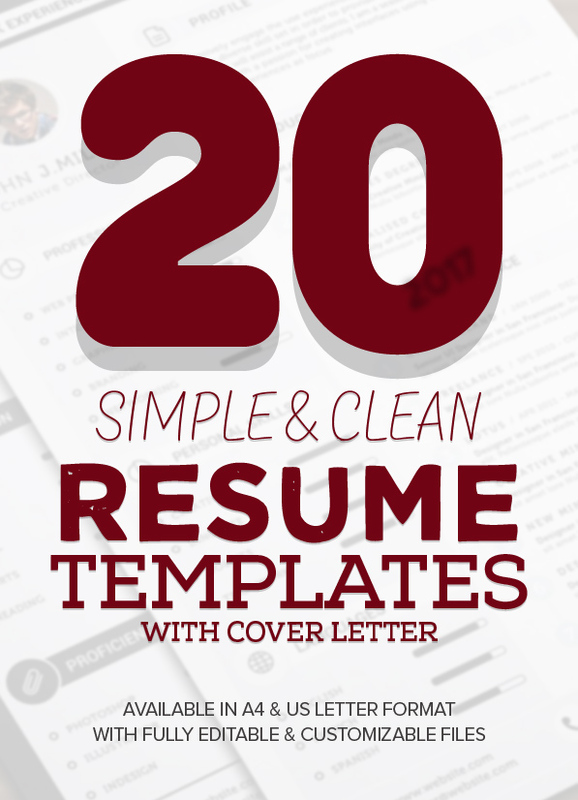 These resume templates are hand-picked and make you stand out of tons of other resumes. Perfect and ideal for designers and artists. Useful, professional, clean and modern one page fully editable resume template. This resume template is perfect for those who want to make a good impresion. We create templates that help you make a lasting impression when applying for your dream career. We aim for sophistication and elegance with a modern twist, combined with a thoughtful design with plenty of space for all your text content. This 2 Pages Resume/CV Print Templates designed to make your printing experience even better with neatly designed layout, CMYK color and layer organization. This is a specially designed handcraft clean two pages resume cv with cover letter, reference page in clean style. This professional Resume Template is made in Adobe Photoshop, Illustrator, Indesign and MS Word aka Microsoft Word. This simple/clean Resume Template is professionally organized and labelled so every beginner can edit it like a pro. Basic Creations produce high-quality, creative templates that may help you land your dream job or simply create a better looking business. Professionally designed, we take a unique approach to boring business documents, creating modern, sophisticated and easy to use templates just for you! Resume Template / CV Template with super modern and professional look. Elegant Resume page designs are easy to use and customise, so you can quickly tailor-make your resume for any opportunity and help you to get your job. Simple and minimal Resume template. Photoshop and Microsoft Word Format. All is vector (shape and icon) In photoshop and MS Word. Easily you can chanage color. This is a specially designed handcraft resume cv with cover letter template in clean hipster style. You will test a vintage style and fully designed in black and white color also ironic. In this diy resume download you will be able to create your own fully customizable resume set where you can display your education, skills, references and experience also a real and very effective cover letter. And there is A LOT of different ways to customize your resume. A beautiful vertical design with a small photo. Including a single page resume/cv and cover letter. All artwork and text is fully customisable; Easily edit the typography, wording, colors and layout. Each template uses a strong baseline/document grid which will allow you to edit or add to the layout very easily. This minimal style set is a great option. It comes with 52 files, with multiple color options, and resume, cover letter, portfolio pages, and matching business cards. Work in PSD, AI, or MS Word. Whether you’re aiming for a design job, or a creative online position, you want to stand out visually as a professional applicant.